Star Boxing presented another exciting night of boxing broadcast live this past Friday on ESPN2. At the historic Olympic Stadium in Montreal, Canada, battle tested veterans Delvin Rodriguez (28-7-4 16KO’s) and Joachim Alcine (35-7-2 21KO’s) fought 10 hard rounds to a draw in a Jr. Middleweight contest. Respected ESPN ringside analyst Teddy Atlas had Rodriquez winning the fight big, and many at ringside thought Rodriguez did enough to earn the decision. Others at ringside felt many of the rounds were very close and difficult to score. Both fighters knew what was at risk entering the bout. Judge Benoit Roussel saw it 97-93 for Rodriguez, Judge Jack Woodburn saw the fight 96-94 Alcine, and Judge Pasquale Procopio saw it even at 95-95. 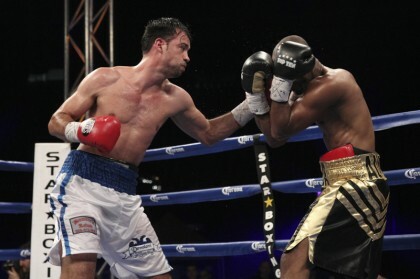 The fighters fought hard in the 10 round bout with Rodriguez being the aggressor for most of the fight. Alcine scored well, especially with the left hand as he played the role of counter puncher and also displayed efficient defensive skills. The local crowd tried to urge Alcine on in the final round but both fighters had expended a lot of energy and neither was able to win the round convincingly. Joe DeGuardia, President/CEO of Star Boxing was pleased with the event: “I enjoyed our time in Montreal and it was very special to put on a show at the famed Olympic Stadium (first boxing show at Olympic Stadium since the famous Sugar Ray Leonard-Roberto Duran fight). Once again we had an upset and exciting, close fights”. The Co-Feature saw a minor upset as Heavyweight Derric Rossy (29-8 14KO’s) score a 10 round majority decision win over Joe Hanks (21-2 14KO’s). Hanks started strongly using his fast hands to score well on Rossy in the opening round but Rossy started to fire his own shots in thwarting the attack of Hanks. Rossy started to take control in the 4th round firing effective combinations while Hanks was throwing one punch at a time. Rossy rocked Hanks badly in the 6th round with a big overhand right but Hanks made it to the bell. Hanks started coming back in the 8th round and hurt Rossy bad in the 9th round with a huge body shot but could not follow up. The undercard saw local fan favorite Wlad Smichet (21-7-3 15KO’s) score a premature 1st round TKO victory over Francois Miville (7-2 3KO’s). Miville suffered a shoulder injury forcing the referee to stop the fight at .56 seconds of the 1st round of a scheduled 6 round Super Middleweight bout. Kevin Lavalle (12-0-1 10KO’s) stopped James Owens (5-18 2KO’s) in the 3rd round of a schedule 6 round Jr. Lightweight bout. Mario Perez (15-5-4 9KO’s) and Christian Uruzquieta (11-2-1 4KO’s) fought to a 4 round draw in a Lightweight bout. 6 amateur fights featuring Canadian fighters opened up the show. Those in attendance included current World Champion Adonis Stevenson and former World Champion Lucian Bute. Previous boxing news: Perez and Capeceta Look for the Win After Fighting to a Draw last Year!